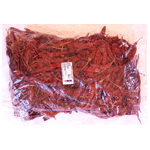 Whole dried red chillies are medium hot, added to hot oil and fried they turn dark in colour and give a lovely flavour to the dish. You will get a hotter flavour if you chop the chillies, releasing the seeds. Popular in hot tarka dishes and thai curry dishes. Product of India.